Deborah Edwards, Sydney moderns: art for a new world , 'Colour, light and rhythm: tools for modernity', pg. 21-33, Sydney, 2013, 30 (colour illus. ), 315. 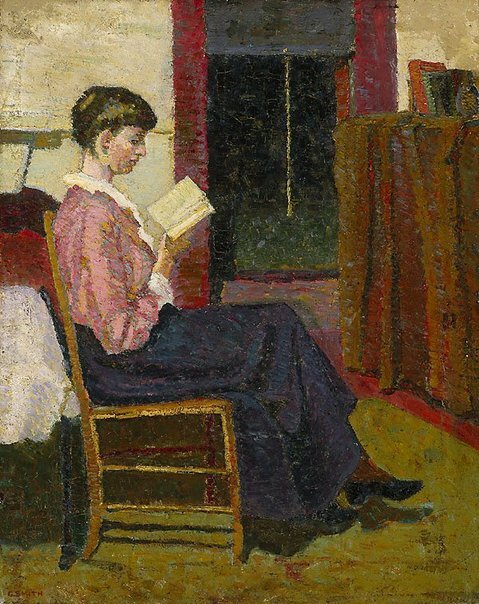 Deborah Hart, Grace Cossington Smith , 'A room of her own', pg. 11-25, Canberra, 2005, 12 (colour illus. ), 53, 123, 174. Martyn Lyons, A history of the book in Australia 1891-1945 , 'Reading models and reading communities', pg. 370-388, St. Lucia, 2001, 377 (illus.). Australian painting 1788-1990 , 'Leviticus 1913-32', pg. 167-204, South Melbourne, 1991, 174. Australian Modern Painting Between the Wars 1914-1939 , 'Light in Sydney', pg. 30-41, Sydney, 1989, 33. Brought to Light: Australian Art 1850–1965 from the Queensland Art Gallery collection , 'A singular portrait. Grace Cossington Smith Portrait of a man', pg. 120-123, Brisbane, 1998, 120.